NYICFF 2010 – Oblivion Island Review « Asian Culture Goes Pop! Ever wondered what happens to your toys and belongings that became discarded? 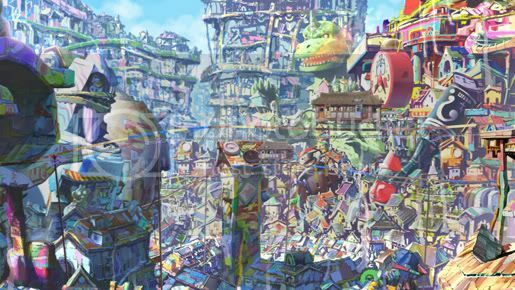 Production I.G.‘s 3-D animated effort, Oblivion Island, shows you in-animate objects all have souls and a life of their own. Our heroine, Haruka, was just a little girl when her mother gave her a mirror as a gift. Unfortunately, Haruka’s mother passed away shortly thereafter. Haruka and her father moved away, packing along with all the memories from childhood (including her mother’s mirror) stashed away. Haruka just wants to get on with her life as a teenager. Where do all the discarded belongings go? They get snatched away by Kitsune, a Japanese folklore legend of a magical and intelligent fox. Haruka made a fateful enchounter with a Kitsune named, Téo. She gets sucked into the world of the Kitsune, with no way out. She also finds out just what happens to all the junk that was discarded by humans: these magical foxes use all the junk create an island shanty-town of their own. Now I wasn’t too impressed with the movie up until this point. I’m too keen on the 3-D art work from the beginning. Boy, was I wrong by the time Haruka lands on Oblivion Island! Don’t believe me? Check out this screen shot. The creativeness of Oblivion Island is ASTOUNDING. Whatever doubts I had about the hokey 3-D artwork were erased from this point forward. The friendship between Haruka and Téo is very touching. Little Téo is considered as a runt among other Kitsunes and is often harassed by a trio of gangsters. He reluctantly helped Haruka to find her mother’s mirror, who is now in the hands of the wicked Baron, who oversees the Kitusne’s world. The Baron also blackmailed Téo to trap Haruka, so she can become his personal slave. Didn’t the Baron know not to mess with small people? There are some spectacular action moments, along with some touching, tear jerking moments. The lesson learned from Oblivion Island: never take your belongings and memories for granted.